The Cairo Affair opening line: On February 19, 2011, two days after the Day of Revolt, the first kidnapping occurred in London, and over the following seventy-two hours similar scenes occurred in Brussels, Paris, and New York. Sophie Kohl is not who she appears to be! She is a woman who loves her husband but has an affair. Her husband is a diplomat accused of selling American secrets. Her lover is a CIA agent who makes the accusation. They are tied together by Cairo, a city undergoing transformation due to the Arab Spring. Sophie is back in Cairo to discover why her husband was assassinated and who ordered the killing. His will not be the only death and the past will always come back to haunt Sophie. Sophie Kohl is living her worst nightmare. Minutes after she confesses to her husband Emmett, a mid-level diplomat at the American embassy in Hungary, that she had an affair while they were in Cairo, he is shot in the head and killed. 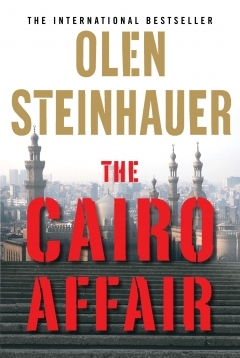 Stan Bertolli, a Cairo-based CIA agent, has fielded his share of midnight calls. But his heart skips a beat when he hears the voice of the only woman he ever truly loved, calling to ask why her husband has been assassinated. Jibril Aziz, an American analyst, knows more about Stumbler, a covert operation rejected by the CIA years ago, than anyone. So when it appears someone else has obtained a copy of the blueprints, Jibril knows the danger it represents… As these players converge on the city of Cairo, Olen Steinhauer’s masterful manipulations slowly craft a portrait of a marriage, a jigsaw puzzle of loyalty and betrayal, against a dangerous world of political games where allegiances are never clear and outcomes are never guaranteed. This book is full of mystery and intrigue, spy agents and double agents and segues seamlessly from the past to the present. The story is told from a few people’s perspectives, and this helps give an overall feeling for what really happened, both years ago, and more recently. I could not put the book down and can highly recommend this as a book worth reading. This sounds really interesting, I love a good mystery! Oh, looks like another good read, Tandy – thanks, just another one to add to the list! Ooo mystery and intrigue. Sounds like two good characteristics for a book! Sounds like a great page-turner! Books set in glamorous locations are always fun to read. Ooh I know that you’re a tough, honest judge so if you couldn’t put this down, it must be good!